Chronic exposure of pancreatic beta cells to proinflammatory cytokines leads to impaired insulin secretion and apoptosis. ARE/poly(U)-binding factor 1 (AUF1) belongs to a protein family that controls mRNA stability and translation by associating with adenosine- and uridine-rich regions of target messengers. We investigated the involvement of AUF1 in cytokine-induced beta cell dysfunction. Production and subcellular distribution of AUF1 isoforms were analysed by western blotting. To test for their role in the control of beta cell functions, each isoform was overproduced individually in insulin-secreting cells. The contribution to cytokine-mediated beta cell dysfunction was evaluated by preventing the production of AUF1 isoforms by RNA interference. The effect of AUF1 on the production of potential targets was assessed by western blotting. MIN6 cells and human pancreatic islets were found to produce four AUF1 isoforms (p42>p45>p37>p40). AUF1 isoforms were mainly localised in the nucleus but were partially translocated to the cytoplasm upon exposure of beta cells to cytokines and activation of the ERK pathway. Overproduction of AUF1 did not affect glucose-induced insulin secretion but promoted apoptosis. This effect was associated with a decrease in the production of the anti-apoptotic proteins, B cell leukaemia/lymphoma 2 (BCL2) and myeloid cell leukaemia sequence 1 (MCL1). Silencing of AUF1 isoforms restored the levels of the anti-apoptotic proteins, attenuated the activation of the nuclear factor-κB (NFκB) pathway, and protected the beta cells from cytokine-induced apoptosis. Our findings point to a contribution of AUF1 to the deleterious effects of cytokines on beta cell functions and suggest a role for this RNA-binding protein in the early phases of type 1 diabetes. The online version of this article (doi: 10.1007/s00125-011-2399-7) contains peer-reviewed but unedited supplementary material, which is available to authorised users. Type 1 diabetes is an autoimmune disease characterised by a progressive loss of pancreatic beta cells. Insulin, the hormone produced by these cells, plays an essential role in the maintenance of blood glucose homeostasis. During the autoimmune attack, macrophages and lymphocytes infiltrate pancreatic islets and release proinflammatory cytokines with a major impact on the expression of key beta cell genes leading to defective insulin secretion and sensitisation to apoptosis [1, 2]. Most studies investigating the causes of beta cell dysfunction during the early phases of type 1 diabetes have focused on the role of signalling cascades culminating in the activation of transcription factors , but, so far, the potential impact of cytokines on mRNA stability has been poorly investigated. Several RNA-binding proteins are known to bind to specific sequences located on the 3′-untranslated region (3′-UTR) of target mRNAs. A family of RNA-binding proteins called AU-rich (ARE)-binding proteins (AUBPs) interacts specifically with adenosine- and uridine-rich regions located in the 3′-UTR of target mRNAs . Under resting conditions, AUBPs are principally located in the nucleus  but, upon stimulation, translocate to the cytoplasm and bind to their targets, leading to mRNA protection, stabilisation, degradation or inhibition of messenger translation . AUF1 (ARE/poly(U)-binding factor 1) , also known as hnRNP-D (heterogeneous nuclear ribonucleoprotein D), was originally identified as a protein that binds and induces the destabilisation of the mRNAs encoding c-myc and granulocyte–macrophage colony-stimulating factor . AUF1 was later reported to affect the stability of a large variety of mRNAs involved in inflammation, cell cycle control or apoptosis [8, 9]. Although the destabilising function of AUF1 is well documented, some studies suggest that the protein can also exert a positive effect on mRNA stability . Four different isoforms of AUF1 resulting from differential splicing of exons 2 and 7 have been described: p37, p40, p42 and p45 . The production of these isoforms varies between cell types and developmental stages and can be modified in response to different stimuli . Moreover, AUF1 isoforms are subjected to post-translational modifications that affect the activation state of the RNA-binding protein in a cell-type and treatment-dependent manner [13, 14]. Since many proteins involved in stress and immune responses or in cellular growth are encoded by mRNAs containing ARE sequences, AUF1 is a good candidate for mediating the alterations in gene expression underlying the impairment in beta cell activities observed in the presence of proinflammatory cytokines. The aim of this study was to investigate the possible involvement of AUF1 in cytokine-mediated beta cell dysfunction and in the development of type 1 diabetes. We found that AUF1 is indeed activated upon exposure to cytokines and contributes to beta cell apoptosis elicited by these proinflammatory mediators. The extracellular regulated MAP kinase (ERK) inhibitor, PD98059, was obtained from Calbiochem–Novabiochem (San Diego, CA, USA). The c-Jun N-terminal kinase (JNK) inhibitor, SP600125, was from Enzo Life Sciences (Plymouth Meeting, PA, USA). IL-1β and the p38 mitogen-activated protein kinase (MAPK) inhibitor, SB 239063, were purchased from Sigma (Buchs, Switzerland). Recombinant mouse IFNγ was obtained from R&D Systems (Minneapolis, MN, USA), and TNFα from Alexis Corporation (Lausen, Switzerland). Hoechst 33342 was purchased from Invitrogen (Carlsbad, CA, USA). The insulin-secreting cell line, MIN6 clone B1 , was cultured at a density of 1.5 × 105 cells/cm2 in DMEM/Glutamax medium (Invitrogen) supplemented with 15% FCS, 50 IU/ml penicillin, 50 μg/ml streptomycin and 70 μmol/l β-mercaptoethanol. The insulin-producing cell line, INS-1E , was cultured at the same density as MIN6 cells in RPMI 1640 (Invitrogen) supplemented with 10% FCS, 50 IU/ml penicillin, 50 μg/ml streptomycin, 1 mmol/l sodium pyruvate and 50 μmol/l β-mercaptoethanol. Transient transfections of MIN6 and INS-1E cells were performed with Lipofectamine 2000 (Invitrogen) following the instructions provided by the manufacturer. For a 24-well plate, 60 pmol small interfering RNA (siRNA) duplexes and 0.8 μg plasmids were used. Human pancreatic islets were provided by the Cell Isolation and Transplantation Center at the University of Geneva, School of Medicine, thanks to the Islets for Research distribution programme of the European Consortium for Islet Transplantation (ECIT) sponsored by the Juvenile Diabetes Research Foundation. The purity of islet preparations used for this study ranged from 80% to 95%, and the samples contained 51 ± 7% (mean±SD) insulin-positive cells, as revealed by immunofluorescence analysis using an antibody against insulin (Linco Research, St Charles, MO, USA). The islets were cultured in CMRL medium (Invitrogen) supplemented with 10% FCS, 100 IU/ml penicillin, 100 μg/ml streptomycin, 2 mmol/l l-glutamine and 250 μmol/l HEPES. Islet cell monolayers were prepared by treating the islets for 7–9 min with trypsin (0.25 mg/ml)/EDTA at 37°C. The trypsinisation was terminated by adding serum-containing culture medium. The cells were seeded at a density of 5.5 × 104 cells/cm2. Human islet cells were transfected using the same conditions as used for MIN6 cells. To experimentally increase AUF1 levels, MIN6 cells were transiently transfected with plasmids expressing enhanced green fluorescent protein (EGFP)-labelled constructs of each individual AUF1 isoform . Reduction of the level of the selected isoforms was achieved using siRNA duplexes directed against: exon 2, targeting p45 and p40 (siAUF1p45p40); exon 7, targeting p45 and p42 (siAUF1p45p42); and a sequence astride exon 3 and 4, targeting all isoforms (siAUF1all). The sequences were the following: siAUF1p45p40, 5′-ACU CCU CCC CAC GAC ACA CTT-3′; siAUF1p45p42, 5′-UCA AGG CUA UGG CAA CUA UTT-3′; and siAUF1all, 5′-AGA AAG AUC UGA AGG ACU ATT-3′. An siRNA duplex directed against green fluorescent protein (GFP; 5′-GAC GUA AAC GGC CAC AAG UUC-3′), which has no effect on pancreatic beta cell functions, was used as control. Total RNA extraction was performed with the RNeasy mini kit (Qiagen, Hilden, Germany). Conventional quantitative RT-PCR (qRT-PCR) was carried out as described previously . Real-time PCRs were performed on a Bio-Rad MyiQ Single-Color Real-Time PCR Detection System (Bio-Rad Laboratories, Hercules CA, USA). The list of primers can be found in electronic supplementary material (ESM) Table 1. Samples were tested in triplicate, and the results were normalised using cDNA amplified with 18S primers in the same samples. For assessment of the secretory capacity, MIN6 cells (2 × 105) plated in 24-well dishes were transiently co-transfected with AUF1-overexpressing plasmids and with a construct encoding the human growth hormone (hGH) (pXGH5; Nichols Institute Diagnostics, San Juan Capistrano, CA, USA). After 72 h, the cells were washed and preincubated for 30 min in Krebs buffer (127 mmol/l NaCl, 4.7 mmol/l KCl, 1 mmol/l CaCl2, 1.2 mmol/l KH2PO4, 1.2 mmol/l MgSO4, 5 mmol/l NaHCO3, 0.1% BSA and 25 mmol/l HEPES, pH 7.4) containing 2 mmol/l glucose. The medium was then discarded, and the cells were incubated for 45 min in either the same buffer (basal condition) or Krebs buffer containing 20 mmol/l glucose (stimulatory condition). After collection of the supernatant fractions, the cells were lysed in PBS containing 0.5% Triton X-100 to evaluate total cellular hGH content. The amount of hGH in the samples was assessed using an hGH ELISA kit (Roche Diagnostics, Rotkreuz, Switzerland). The same was performed for measurement of insulin secretion except that the cells were not co-transfected with hGH and the cells were lysed in ethanol/acid (75% ethanol, 1.5% HCl and 23.5% water) to evaluate total insulin content. The amount of insulin in the samples was assessed using Insulin ELISA (EIA) (SPI-bio, Montigny-le-Bretonneux, France). Subcellular fractionation was performed as described by Li et al. . Briefly, cells were lysed for 15 min on ice using a Triton X-100 lysis buffer (50 mmol/l Tris/HCl, pH 7.5, 0.5% Triton X-100, 137.5 mmol/l NaCl, 10% glycerol, 1 mmol/l sodium vanadate, 50 mmol/l NaF, 10 mmol/l sodium pyrophosphate, 5 mmol/l EDTA and the Protease Inhibitors Cocktail [Sigma, St Louis, MO, USA]). After a 15 min centrifugation at 12,000 g, the supernatant fraction was collected and stored as ‘cytoplasmic fraction’. The pellet was washed and resuspended in Triton X-100 lysis buffer containing 0.5% SDS. After sonication, the tube was centrifuged at 12,000 g for 15 min. The supernatant fraction yielded the ‘nuclear fraction’. To obtain whole cell extracts, the cells were directly scraped into SDS-containing lysis buffer. Protein extracts (25–50 μg) were separated on polyacrylamide gels and transferred to poly(vinylidine fluoride) membranes. The membranes were incubated overnight at 4°C with primary antibodies. Immunoreactive bands were visualised by chemiluminescence (Amersham Biosciences, Piscataway, NJ, USA) after incubation with horseradish peroxidase-coupled secondary antibodies for 1 h at room temperature. The antibody against AUF1 (07-260) was purchased from Upstate (Temecula, CA, USA). The antibodies against myeloid cell leukaemia sequence 1 (MCL1 [sc-819]) and lamin B (sc-6216) were purchased from Santa-Cruz Biotechnology (Santa-Cruz, CA, USA). The antibodies against B cell leukaemia/lymphoma 2 (BCL2 ), inhibitor of kappa B (IκBα; 4814) and phospho-IκBα (2859) were purchased from Cell Signaling Technologies (Danvers, MA, USA). The antibody against actin (MAB1501) was from Chemicon International (Temecula, CA, USA). Finally, the antibody against α-tubulin (T5168) was obtained from Sigma (Buchs, Switzerland). For the assessment of the apoptotic activity, MIN6 cells (1 × 105) and human dissociated islet cells plated in 24-well dishes were transiently transfected with plasmids overexpressing AUF1 isoforms or with siRNAs reducing their endogenous level. Apoptosis was assessed 2 days later by staining the cells with Hoechst 33342 (Invitrogen) and scoring the cells displaying pyknotic nuclei. The experiments were carried out blindly, and at least 800 cells per condition were analysed. Transfected MIN6 cells were incubated overnight at 4°C with primary antibody directed against cleaved caspase 3 (9661; Cell Signaling). Immunolabelled proteins were visualised by incubating the cells for 1 h at room temperature with fluorescent secondary antibodies (Invitrogen). Images were obtained by fluorescence microscopy. Statistical differences were tested by ANOVA. The experiments including more than two groups were first analysed by ANOVA, and multiple comparisons of the means were then carried out using the post hoc Dunnett’s test, with a discriminating p value of 0.05. We first determined the production pattern of AUF1 isoforms in pancreatic beta cells. We found that the mouse insulin-secreting cell line, MIN6, expresses all four AUF1 isoforms. The two larger isoforms, p45 and p42, are the most abundant, while p40 and p37 are less abundantly produced (Fig. 1a). A similar pattern was observed in human pancreatic islets (Fig. 1b) and in the rat insulin-secreting cell line, INS-1E (not shown). Exposure to IL-1β (10 ng/ml; 5000 U/ml) for 24 h, alone or with a mix of cytokines including IL-1β (0.1 ng/ml; 50 U/ml), TNFα (10 ng/ml; 500 U/ml) and IFNγ (30 ng/ml; 50 U/ml), two conditions that trigger beta cell apoptosis, affected neither the total amount of AUF1 present in MIN6 cells nor the ratio between isoforms (ESM Fig. 1a, b). Similar data were obtained with human islets incubated in the presence of 10 ng/ml IL-1β (ESM Fig. 1c). We then analysed the subcellular localisation of AUF1 isoforms. As demonstrated by the distribution of specific markers (tubulin and lamin B), our fractionation protocol allows a clear separation between cytosolic and nuclear compartments (Fig. 2a). We found that, under resting conditions, the bulk of p45 and p37 is localised in the nucleus, while p40 is detected mainly in the cytosolic fraction. p42 is readily detectable in both fractions and represents the most abundant isoform in the cytosol (ESM Fig. 2a, b). Although, as indicated above, cytokines do not affect the total cellular AUF1 content, exposure to these inflammatory mediators led to redistribution of a fraction of the RNA-binding protein between cellular compartments. Indeed, 24 h of treatment with the cytokine mix increases AUF1 levels in the cytosolic fraction and decreases those detectable in the nuclear fraction, suggesting activation and translocation of the protein from the nucleus to the cytoplasm (Fig. 2a, b, c). The redistribution of AUF1 isoforms was prevented by a pharmacological inhibitor of the mitogen-activated protein kinase (MAPK), ERK (Fig. 3a, b, c), but not by agents blocking the JNK or p38 kinase pathways (not shown). To assess whether AUF1 activation contributes to cytokine-mediated beta cell dysfunction, AUF1 isoforms were either overproduced individually in MIN6 cells using specific constructs or silenced by RNA interference. Each of the EGFP-tagged AUF1 constructs was overproduced to comparable levels, and taking into account a transfection efficiency with plasmids of ∼30% (determined by scoring EGFP-positive cells) led to an approximately twofold to threefold increase in the cellular level of each individual isoform (ESM Fig. 3). Exogenously produced AUF1 isoforms displayed a subcellular localisation comparable to the endogenous proteins and were mainly localised in the nucleus (ESM Fig. 3). Silencing of AUF1 isoforms was achieved with siRNAs directed against different regions of the transcripts. We used siRNAs directed against exon 2 (shared by isoforms p45 and p40), exon 7 (shared by p45 and p42) or a sequence astride exon 3 and 4 (present in all isoforms) (Fig. 4a). The efficiency of each of the three siRNAs was assessed by western blotting (Fig. 4b, c, d). We first examined whether changes in the level of AUF1 alter the capacity of pancreatic beta cells to synthesise and secrete insulin. Overproduction of each isoform independently did not significantly affect proinsulin mRNA levels (ESM Fig. 4a). Moreover, blocking the production of AUF1 isoforms using siRNAs was not sufficient to restore proinsulin production (ESM Fig. 4b) and insulin content (ESM Fig. 4c) in MIN6 cells treated with IL-1β (10 ng/ml) for 24 h.
We then assessed whether AUF1 overproduction affects the secretory properties of beta cells. Overproduction of AUF1 isoforms did not influence insulin secretion under basal (2 mmol/l glucose) or stimulated (20 mmol/l glucose) conditions (ESM Fig. 5a). To verify that failure to detect changes in insulin secretion is not caused by the relatively low transfection efficiency, the cells were transiently co-transfected with AUF1-overproducing constructs and with an hGH-encoding plasmid. hGH is specifically targeted to beta cell secretory granules and is co-released with insulin , allowing selective monitoring of exocytosis from the transfected cells. AUF1 overproduction affected neither basal nor glucose-induced hGH release, confirming that the RNA-binding protein does not regulate the production of essential components of the beta cell secretory machinery (ESM Fig. 5b). Prolonged exposure of pancreatic beta cells to cytokines sensitises them to apoptosis. We found that overproduction of p40, p42 and p45 isoforms increases the apoptotic rate of ΜΙΝ6 cells by more than two fold (Fig. 5a). In contrast, p37 had no significant effect on cell survival. Interestingly, the siRNAs directed against AUF1 isoforms reduced caspase 3 activation elicited by cytokines (Fig. 5b) and partially protected the cells from apoptosis (Fig. 5c). We then tested whether the siRNAs directed against AUF1 isoforms improve survival of primary human beta cells in the presence of cytokines. Transfection of human islet cells with siRNAs directed against AUF1 led to a decrease of ∼75 ± 7% of the mRNA encoding the RNA-binding protein. As was the case for MIN6 cells, blockade of AUF1 production protected human dissociated islet cells from cytokine-induced apoptosis (Fig. 5d). Human islet preparations are not composed exclusively of beta cells. However, taken together with the results obtained with MIN6 cells, these findings indicate that activation of AUF1 is part of the signalling cascades leading to cytokine-mediated beta cell death. Next, we attempted to determine the molecular mechanisms underlying the effect of AUF1 on beta cell survival. It has been previously demonstrated that AUF1 isoforms can destabilise the mRNAs encoding the anti-apoptotic protein, BCL2 . Western blotting analysis revealed that overproduction of p45 AUF1 results in a significant decrease in the production of BCL2 (Fig. 6a, b). Overproduction of p40 and p42 displayed a similar tendency, but, possibly because of the relatively low transfection efficiency obtained with plasmids, this did not reach statistical significance. Transfection of the cells with the siRNAs that reduce AUF1 production (all of them block p45) restored BCL2 levels in IL-1β-treated cells (Fig. 6c, d). This effect is potentially linked to the increase in Bcl2 mRNA stability observed upon AUF1 silencing (ESM Fig. 6 top panel). These findings may explain, at least in part, the protective effect of the siRNAs on beta cell survival. Recently, MCL1, another anti-apoptotic protein belonging to the BCL2 family, was shown to be downregulated on prolonged exposure of beta cells to proinflammatory cytokines and to be involved in pancreatic beta cell apoptosis . Interestingly, we found that transfection of MIN6 cells with the siRNAs that diminish AUF1 production restore MCL1 levels in IL-1β-treated cells (Fig. 6c, e). In contrast with BCL2, this effect was not related to changes in mRNA stability (ESM Fig. 6 middle panel). Chronic activation of the nuclear factor-κB (NFκB) pathway plays a central role in cytokine-mediated beta cell death . Since silencing of AUF1 prevents apoptosis triggered by cytokines, we assessed whether reduction of the level of the RNA-binding protein affects this important signalling pathway. We discovered that phosphorylation of IκBα elicited by a mix of cytokines, an essential step in the activation of the NFκB pathway, is strongly impaired in cells in which AUF1 isoforms are downregulated (Fig. 7a, b). In contrast, phosphorylation of JNK, another signalling pathway playing a central role in cytokine-mediated apoptosis, was unaffected (data not shown). Many of the deleterious effects triggered by chronic NFκB activation in insulin-secreting cells result from the induction of inducible nitric oxide synthase (iNOS)  and of several chemokines  thought to elicit an inflammatory cascade that promote the development of type 1 diabetes . In agreement with the data described above, we found that the induction of iNOS elicited by 6 h of IL-1β treatment is significantly attenuated in MIN6 cells transfected with the siRNAs against AUF1 (Fig. 8a). Moreover, the rise in two chemokines containing an AUF1-binding motif in their 3′-UTR, chemokine (C-C motif) ligand 2/monocyte chemotactic protein 1 (CCL2/MCP1) and chemokine (C-X-C motif) ligand 2/macrophage inhibitor protein 2 (CXCL2/MIP2) , elicited by proinflammatory cytokines was significantly diminished upon blockade of AUF1 production (Fig. 8b, c). Taken together, these findings point to an important contribution of AUF1 in NFκB-induced inflammatory reactions, occurring in the initial phases of type 1 diabetes. The initial phases of type 1 diabetes are characterised by a cytokine-mediated inflammatory reaction directed against pancreatic islets, which culminates in a progressive loss of beta cells. Proinflammatory cytokines released by T lymphocytes and macrophages invading the islets and by the endocrine cells themselves alter beta cell gene expression by affecting the activity of important transcription factors leading to impairment of key signalling pathways. The involvement of transcription factors such as NFκB, signal transducers and activators of transcription 1 (STAT1) and activator protein 1 (AP-1) in cytokine-mediated beta cell damage has been extensively investigated . However, it is becoming increasingly clear that other regulatory molecules, acting upstream or downstream of transcription factors, make an important contribution to the control of gene expression. This is the case for RNA-binding proteins, such as AUF1, that bind to specific regions of their target mRNAs, thereby influencing their stability and translation. There is mounting evidence that AUF1 plays a central role in inflammation. Indeed, AUF1-binding motifs are present in the messengers of important inflammatory mediators such as the cytokines, TNFα and granulocyte–macrophage colony-stimulating factor [27, 28], the chemokines, CXCL2/MIP2 and CCL2/MCP1 , and those of some interleukins [29, 30]. Moreover, AUF1 affects the production of important components of the signalling pathways initiated by cytokines [31, 32]. Here, we demonstrate that beta cells produce four AUF1 isoforms that are differentially distributed between the cytosolic and nuclear compartments. The localisation of AUF1 can be influenced by a variety of factors including: the presence or absence of exons containing nuclear localisation signals [33, 34]; interaction with transporters  or chaperones [36, 37]; protein ubiquitination ; and phosphorylation of specific residues [7, 38]. At steady-state, most AUF1 isoforms accumulate in the nucleus but are partially relocalised upon exposure of insulin-secreting cells to proinflammatory cytokines. The precise mechanisms underlying the nucleocytoplasmic shuttling of the protein have not yet been defined. However, since the effect of the cytokines can be prevented by inhibiting the MAPK, ERK, this process is likely to involve the phosphorylation of one or more residues of AUF1. In agreement with this hypothesis, nuclear ERK has recently been reported to stimulate nucleocytoplasmic translocation and activation of AUF1p42 . In contrast, in our hands, neither JNK nor p38 MAPK appeared to affect the localisation of AUF1 isoforms. Prolonged exposure of beta cells to cytokines sensitises them to apoptosis. Overproduction of p40, p42 and p45 AUF1 isoforms mimicked the effect of the cytokines and led to a similar impact on beta cell survival. Moreover, blockade of AUF1 production protected the beta cells from apoptosis elicited by the cytokines, indicating that this RNA-binding protein contributes to the deleterious events that lead to death of insulin-secreting cells upon chronic exposure to these inflammatory mediators. We were able to partially elucidate the mechanisms through which AUF1 affects beta cell survival. Indeed, the reduction of the production of two anti-apoptotic proteins, BCL2 and MCL1, elicited by cytokines was efficiently prevented by silencing AUF1. Both of these anti-apoptotic proteins have been shown to play a role in beta cell survival [22, 40]. The effect of AUF1 on BCL2 may be mediated, at least in part, by direct association of the RNA-binding protein to the AU-rich elements present in the 3′-UTR of Bcl2 mRNA, resulting in messenger destabilisation [21, 41]. Indeed, we observed that silencing of AUF1 results in a small but significant increase in Bcl2 mRNA stability. So far, consensus sequences for AUF1 binding have not been identified in the Mcl1 mRNA. Moreover, blockade of AUF1 production by RNA interference appears not to influence Mcl1 mRNA stability. Thus the level of this anti-apoptotic protein is likely to be modulated indirectly through the modification of other regulatory factors. Our results suggest that one of the key signalling pathways involved in beta cell apoptosis is also regulated by AUF1. The transcription factor NFκB contributes to cytokine-mediated beta cell dysfunction and to the development of type 1 diabetes. 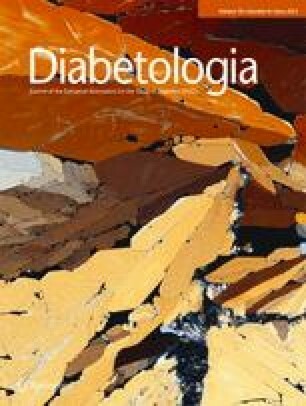 Indeed, Eldor and collaborators showed that mice producing an NFκB repressor are protected from diabetes induced by streptozotocin injections . Recently, inhibition of AUF1 was reported to prevent lipopolysaccharide-induced NFκB signalling in monocytes and macrophages . In agreement with these data, we found that phosphorylation of IκBα elicited by a mix of cytokines, an essential step in the activation of the NFκB pathway, is strongly impaired in cells in which AUF1 isoforms are downregulated. The attenuation of the NFκB signalling resulted in reduced induction of iNOS and diminished production of the chemokines, CXCL2/MIP2 and CCL2/MCP1. In other cell types, AUF1 destabilises iNos mRNA . Although our data did not reach statistical significance, in MIN6 cells treated with siRNAs directed against AUF1, iNos mRNA tended to be more stable (ESM Fig. 6 bottom panel). Therefore we cannot rule out the possibility that a similar mechanism also takes place in beta cells. However, even if present, in MIN6 cells the effect on mRNA stability appears to have less impact on iNOS levels than the attenuation of the NFκB signalling. NO production plays a pivotal role in the deleterious action exerted by proinflammatory cytokines on beta cells . Therefore, at least part of the protective effect of AUF1 silencing can probably be attributed to the smaller induction of iNOS. Chemokines such as CXCL2/MIP2 and CCL2/MCP1 released by beta cells chronically exposed to cytokines are thought to constitute an immunogenic signal that favours the recruitment of immune cells and contributes to the amplification of the inflammatory reaction . Our findings indicate that activation of AUF1 can modulate this inflammatory signal that promotes the development of type 1 diabetes. In this study, we highlighted an important contribution of AUF1 to the deleterious effects of proinflammatory cytokines on beta cell survival. We were able to partially dissect the events leading to AUF1 redistribution and to characterise the signalling cascades downstream of the activation of the RNA-binding protein. Future studies need to precisely identify the molecular mechanisms regulating the nucleocytoplasmic shuttling of AUF1 in cytokine-treated beta cells and to definitively assess its contribution to the development of type 1 diabetes. Our findings suggest that a better knowledge of the role played by AUF1 and other RNA-binding proteins in the islet inflammatory reaction could potentially open the way to new strategies to prevent beta cell death and the development of type 1 diabetes. This work was supported by the Swiss National Science Foundation grant 31003A-127254 (to R. Regazzi). ER generated the researched and analysed the data, wrote the manuscript and approved its final version. SG generated the researched and analysed the data, critically reviewed the manuscript and approved its final version. AP contributed to interpretation of the data, critically reviewed the manuscript and approved its final version. RR conceived and designed the experiments, analysed the research data, wrote the manuscript and approved its final version.